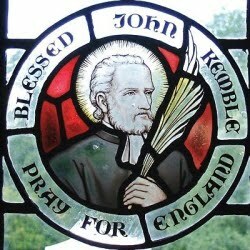 On this date in 1679, 80-year-old Catholic priest John Kemble was martyred for the faith at Hereford. Kemble had been discreetly performing the offices of his faith — still illicit, but less liable to get you killed at this late date — for over five decades since ordination. Unhappily, Titus Oates and his tall tales of a Popish Plot to assassinate King Charles II came along at the end of that run. In the ensuing anti-Catholic spasm, Kemble was one of the unlucky ones rousted. According to the course of nature I have but a few years to live. It will be an advantage to suffer for my religion and therefore I will not abscond. He got the mild consolation of hanging to death before the unpleasant drawing-and-quartering bits were executed upon him, and calmly puffed a pipe and shared a bowl of wine with the sympathetic representatives of the law before it all happened. As a result, Herefordshire long called the comforts enjoyed before a parting a “Kemble pipe” and “Kemble cup”. He’s been elevated to sainthood on the strength of his posthumous miracles, like healing the jailer’s daughter of throat cancer; the holy man’s severed hand, held at St. Francis Xavier’s in Hereford, is supposed to have saved a man from death as recently as 1995. 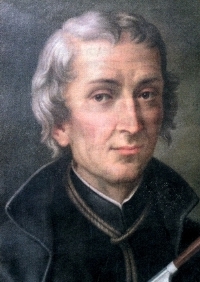 Kemble was among the last of the Forty Martyrs of England to die for the Catholic faith; a fellow-inmate, David Lewis, paid his own penalty just five days later.